Collyer's students and staff explore cretaceous geology. Collyer’s first year geologists visited Stone Farm Rocks, on a trip led by Ian Carr (Collyer’s head of geology). During the trip they were helped by well-known local geologist, Helena Griffiths. The Collyer’s students and staff visited the area to explore and investigate the fascinating Cretaceous geology. The group received detailed technical training in how to draw field sketches, construct rock descriptions, measure dips and strikes and record graphic logs. Ian Carr said: “This was an extremely valuable trip, vital to the course content in the second year of geology. Collyer’s head of faculty for science and mathematics, Dr Rob Hussey was thrilled. 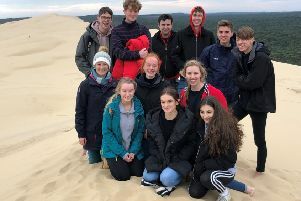 Collyer’s vice principal Dan Lodge said: “What a fantastic trip and well done to the students and staff for throwing themselves into some action-packed field work.